If only there was a way to make money off of a website people spend so much time on. As a matter of fact, there is! A few ways, actually, and the proof is in the people (and businesses) who’ve cashed in on their video strategy. Who’s making content worthy of a nearly hour-long visit to youtube.com? Well, YouTube isn’t just for amateur filmmakers and people videotaping their zainy housepets anymore. Musicians, TV networks, small businesses, and the self-employed all find monetary value in posting their own amazing content on a YouTube channel. 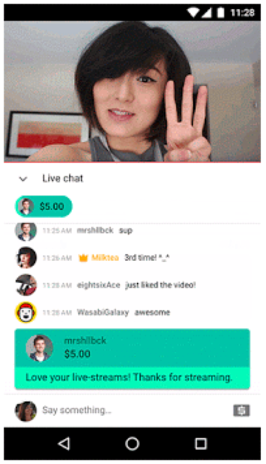 An active, entertaining YouTube channel — which is free to make through a Google+ account (also free) — strengthens these users’ brands and extends their reach to new audiences. It can also build a base of subscribers that other companies using YouTube will actually pay to advertise their products to. There are two ways to earn money on YouTube: as an advertiser and as an ad platform. As an advertiser, you pay YouTube for Preroll, Bumpers, or TrueView ads that get your videos in front of potential buyers. As an ad platform, you publish videos that are watched enough to host others’ content as a paid affiliate or YouTube Partner. Here’s a breakdown of both monetization strategies, along with remarks from the YouTubers who’ve successfully made money using each strategy. Want to jump to a specific point in this article? Click the following links to jump to each YouTuber, how much they’re estimated to make, and how they’re making it. As an advertiser on YouTube, you’re populating your YouTube channel with video advertisements made by you. The difference between YouTube ads and, say, TV commercials, is that you get to show YouTube ads to more specific and often more engaged audience segments. You’ll pay YouTube to host your ads on other, highly watched YouTube channels that appeal to the same viewership you’re targeting. The channels on which you host your video ads can range from big brands all the way to individual users who’ve made videos that are a hit with your audience. When advertising on YouTube, you should know going in that you’re playing the long game. It can be scary to pay others for top video slots that don’t guarantee you’ll be seen by your ideal buyer — let alone get click-throughs to your website that you can convert into long-term customers. In-Stream videos play right before the YouTube user’s selected video, “in the stream” of that chosen video. Users can opt to skip this video after five seconds of it playing, as shown below, and jump to their content. In-Stream ads can be between 12 seconds and six minutes in length. Because of the time you’re allotted with this ad format, it’s suggested that you create this type of ad with the goal of views and brand development, rather than just clicks into your website. This ad ideally generates revenue from the long-term brand awareness that comes out of a story people don’t want to skip, and one viewers remember the next time they approach your product or service. Clash Royale, a popular game app for mobile devices, has produced TrueView ads that are consistently in YouTube’s top 10 most highly watched ads of the year. The company’s 2017 ad, “The Last Second” (shown below), garnered more than 110 million views by the end of that year. This campaign contributed to a YouTube marketing strategy that makes the app developer no less than $2.6 thousand per month, as estimated by SocialBlade. Like In-Stream ads, Preroll ads play in the stream immediately before a user’s selected video. The difference is this ad type can’t be skipped after five seconds. These videos also run a maximum of 30 seconds, though YouTube recently confirmed it will limit advertisers to 15- and 20-second options starting this year. You can also leverage YouTube’s remarketing options, which enable you to send new videos back to users who’ve already engaged with your YouTube channel. If you’re a HubSpot user, and you’ve built smart forms for capturing new information on returning visitors, remarketing can be a terrific addition to an inbound marketing campaign. This remarketing option helps you learn more about a person’s background and interests when they receive new videos that bring them to new landing pages. Bumpers are the shortest ads you can buy. These six-second spots play just before a viewer’s selected video (like the above two options) but are best for brand awareness in the short breaks between long videos, or a YouTube playlist a user might be listening to in the background. 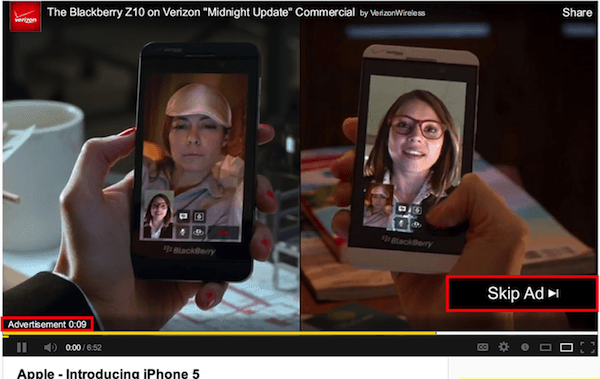 So how do you track the performance of these three video ad formats? Once you’ve created a YouTube channel and uploaded your video content, you can open a Google AdWords account and link it to your video campaign. In AdWords, select the campaign type, ad format, your budget, and to whom and where to show each video on YouTube. You can target very specific audiences, and track the conversion rate of each video individually to see how much business (and revenue) you’re driving. See this blog post to learn more about this process. If advertising is a marathon, the next two strategies are a sprint … sort of. When you think about how to make money on YouTube, you’re probably thinking of the following options. In this case, you’re the one getting paid to host others’ advertisements — the other side of the YouTube advertising relationship. The YouTube Partner Program (YPP) allows the website’s most successful YouTube channels to monetize their content by serving ads made and paid for by other YouTube users. Under the box, “Monetization,” click “Enable.” Don’t be fooled if it says you’re already “Eligible” to the left; this just indicates there are no restrictions against you from trying to become a Partner. You’ll be asked to agree to the YPP Terms. Do so, and you’ll then sign up for an AdSense account so you can receive revenue through your monetized YouTube account. YouTube typically emails you a decision on whether they’ve accepted you into the YPP within a week of applying, so sit tight. Still trying to hit the right watch hours and channel subscribers? Keep in mind you should be posting prolifically — having just one or two videos on your channel that you’re personally proud of won’t cut it. T-Series is a prime example of how volume and consistency can make you a sought-after channel by advertisers on YouTube. This India-based record company posts numerous music videos for songs written and performed in Bollywood, India. And although the company was founded in 1984 and has been on YouTube for nearly 10 years, keeping with this music video strategy has finally put them a position to dethrone PewDiePie (the famous video game-focused YouTube user) as the most popular YouTube channel in the world — with a whopping 83 million subscribers. By publishing multiple videos a week, you can build your viewership, qualify for YPP, and make decent cash. YouTube splits ad revenue 55-45 with its partners — 45% to Google, 55% to you. That means an advertiser who invests $200 in serving ads on your channel can bring you $110 for your videos’ real estate. T-Series’s president attributes their success on YouTube to the fact that the business doesn’t go into any one project thinking it will make money. Rather, the regular “bets” they place on YouTube increase their chances of capturing its audience, and increasing their following as a result. As an affiliate, there is no eligibility requirement — you’re taking advertising into your own hands. This is a great option for YouTube channels that offer reviews and how-to’s, and frequently recommend new products to its viewers. Working as an affiliate of various brands can make you money — albeit usually less than a YouTube Partner campaign — each time that company makes a sale off a link you post on one of your videos. In this case, you’re earning revenue from the company of which you are an affiliate, rather than from YouTube and its advertisers. Start by joining an affiliate network through sites like Click Bank or Amazon’s Affiliate Program, and follow the signup instructions. Keep in mind that each program takes a different percentage of a sale as commission, and your success is still tied to the popularity of your YouTube channel. YouTube personality Marques Brownlee, whose YouTube channel is shown promoting affiliate links in the screenshot above, is a consumer electronics reviewer on YouTube. This makes affiliate advertising the perfect revenue stream for his channel because his advertisers are effectively paying for Marques to review — and, assuming it’s a positive review, promote — their products to his viewers. Marques says he also generates revenue through the YouTube Partner Program, according to Recode. In the example above, Marques reviews a pair of headphones by Bose, suggesting they might be the best noise-cancelling headphones on the market. This made him an affiliate of Bose — just one piece of a YouTube marketing strategy that makes Marques no less than $6,900 per month, according to SocialBlade. What exactly is fan-funding? It’s exactly what it sounds like: viewers donate money to your channel if they find your content enjoyable. It’s the perfect option for videos managed by charities and nonprofits, but even for-profit businesses and independent creatives can publish videos and YouTube Live streams that encourage contributions from their audience. Streaming platforms such as Twitch.tv, which webcasts video games and general interest content, sees accounts that are two years or older make $80 in “tips” per year on average. Twitch.tv’s most popular users make thousands. There’s no shortcut to well-earned cash money, even on YouTube. The good news is video is taking up an increasingly wide slice of global internet bandwidth, and there are numerous ways to produce video content that’s good enough for people to pay for.